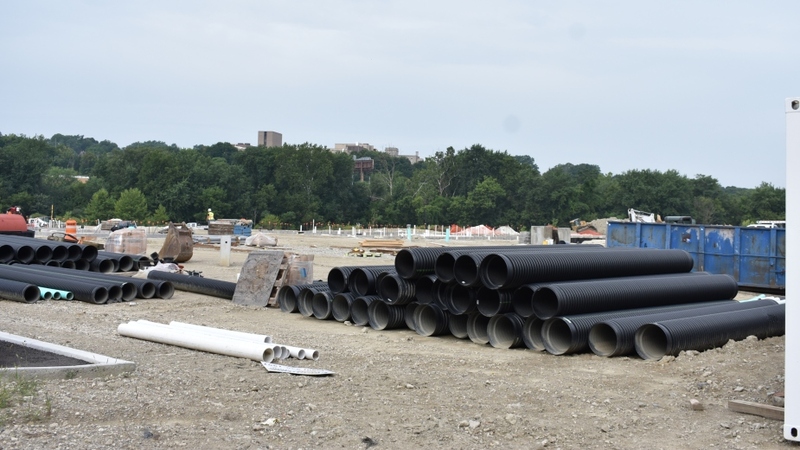 YOUNGSTOWN, Ohio – Work on the Youngstown Foundation Amphitheater and riverfront park downtown is on track to be finished by its scheduled May 2019 completion date, a city official said Thursday. In April, the city hired Brock & Associates Builders Inc., North Lima, to serve as general contractor for the project. Brock’s $8.01 million contract was slightly modified Thursday with an additional $49,705.02 in work being more than offset by the elimination of a portion of the approved work totaling $89,760 that was no longer deemed necessary. This resulted in a net deduction of $40,054.98 in the contract. The additional work called for the removal of sidewalk pavement on Emily Street that was not covered in the original contract, but proved to be necessary, according to the city’s construction engineer, Kedar Bhide. The deduction was because of fencing called for in the contract that wasn’t needed. The city’s Board of Control approved the changes in the contract – the first thus far – at its meeting Thursday. Work on the downtown amphitheater will be completed next May, ahead of a planned summer 2019 opening, Bhide said. “They’re on schedule,” he remarked. Brock began work on the site in early June and has encountered no obstacles so far, said its president, Brian Brock. Foundations at the site are now being installed, he reported. “We’re going to start masonry structures next week and steel about two weeks out,” he continued. There are seven buildings on the site, including the band shell, he said. Construction of the masonry structures will likely take a couple of months. The Youngstown Foundation, which is celebrating its 100th anniversary this year, provided $3 million toward the project in exchange for naming rights for 20 years.